Aria "Bete aber auch dabei"
Daniel Hope is not only one of the most talented musicians of our time, but also one of the most imaginative, seemingly incapable of making a dull or predictable album. This is no exception . . . [Hope directs] an eloquent performance of Vivaldi's "Four Seasons" . . . as well as contributing some dazzling violin solos . . . first-class performances make you think not how great the musicians are, but how great the music is. This album proves it . . . [in the second half,] what you get is a remarkable range of music, much of which is really rewarding listening. [Vivaldi / "Le quattro stagioni"]: The performances here are simply lovely -- crisp, clean and warm, with some brilliant playing from Hope and an excellent continuo sound from the harpsichord, theorbo and baroque guitar . . . the CD is an absolute delight . . . [the brief tracks are all real winners, including] a particularly striking improvisation on "Amazing Grace" with Dom Bouffard on electric guitar . . . Hope's lovely solo violin arrangement of Brahms' lullaby, "Guten Abend, gut' Nacht", provides a beautiful close to an outstanding CD.
. . . [this new recording of "The Four Seasons"] is more than good: it's outstanding . . . Especially to be welcomed is Hope's fluent, abundant decoration of the melodic line, particularly in the slower movements, which is echoed by the marvellously imaginative continua section's own elaborations . . . a bracing new take on a classic . . . providing a new context for it . . . There follow such evocative conjunctions as Rameau's "Danse des Sauvages" and Ol' Fritz's colourful portrait of Frederick the Great . . . The effect is quite magical, and sends you back to Vivaldi's original with fresh ears and a grateful soul.
. . . superb performances from a gifted violinist . . . [Vivaldi / "Le quattro stagioni"]: Immediately noticeable is that his rhetoric is distilled, clear and engaging in every bar. Ornamentation is expressive, historically informed and elegant . . . and the pace of each movement and feeling is thoughtful and attractive . . . Hope's sound and aesthetic is refined . . . Hope is rewarded by a superbly expressive and refined continuo section . . . he is joined by an array of distinguished artists including Jacques Ammon and Chilly Gonzales, piano and Anna Lucia Richter, a glorious soprano voice, who contributes a Bach Cantata aria . . . Rameau's "Danse des Sauvages" from "Les Indes galantes" is a real treat . . . ["Spring 1" from "Recomposed: Vivaldi, The Four Seasons" is] a powerful, contemporary and attractive reflection on the work of Vivaldi . . . Very highly recommended. Seasons" intimately; his interpretation is characterful and bold . . . beautiful liner notes -- featuring 12 specially commissioned images . . . The Vivaldi, performed with the Zurich Chamber Orchestra, sounds buoyant and pleasingly energetic . . . The draw here are the monthly baubles . 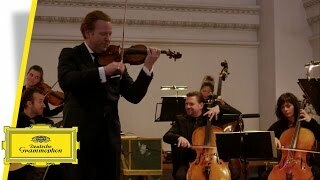 . .
Sehr leicht, filigran und oft nachdenklich spielt Daniel Hope Vivaldis "Jahreszeiten" und entfernt sich damit weit von der barock-geigerischen Virtuosen-Attitüde. Das ZKO geht diesen Weg eindringlich und wach mit -- und man hört die viel gespielten Geigenhits tatsächlich ein wenig neu . . . Originell.